Unfortunately, I haven’t been able to trace the source, and I have no idea with what kind of methods these “average” faces are arrived at. What is striking is, of course, that it seems that the average woman’s face in any of the named countries is about 20. A lot of the discussions that I stumbled on when trying to find whence this picture originated dealt with whom of those averages is the hottest. And that brings out the other remarkable thing about this picture and that is that all the faces are beautiful. Not sure what to think of it, actually, but since this pic is being discussed on hundreds of fora across the world, I thought I would put it up here and have it discussed in a somewhat more enlightening way. If there’s anything legitimate to it, I imagine that it would come out of the University of Regensburg, which does a lot of psychological and anthropological work using facial composites; the result looks very different from anything I’ve seen from them, but I don’t keep a close eye on the work. Averaged faces do tend to look younger and more attractive (wrinkles and marks get averaged out, for instance, and facial features become more typical) but the results tend to depend quite a bit on the photographs from which the composites were built, so you’re right to question how meaningful the ‘average’ is here — ‘average’ here can only mean ‘average of the photographs started with’ — without knowing anything about the original photographs, nothing can be said about the averaged result. There has been some research done suggesting composites of 32 faces are more attractive than the originals, or composites of smaller numbers of pictures. This is true for men and women and is hypothesised to be due to the merging out of unusual or uncommon features. See Langois and Roggman, 1990. Similar stuff comes up in the papers every now and then. P.S. I think the original pictures may come from here – the comments would suggest so. And there are males here too – interesting it’s the women’s pictures that have travelled. https://pmsol3.wordpress.com/ – the last blog right now shows the European pictures – the link to pages for other continents are halfway down the left sidebar. In the comments, it is said the original pictures are from http://www.faceresearch.org/demos/average and of people the compositor judged to be between 20 and 50. The method for averaging faces is actually quite old, already dating from about 1870 when Galton tried to make an average of photographs of faces of criminals. He found the resultant image to be unexpectedly handsome (an effect which has since been often replicated – averaged faces are seen as attractive). there is Indian, and then South Indian too? It seems to me the darker skinned people are lightened up. I think someone upthread mentioned this, but I’ve heard and read that when you average any group of faces together, the result is “beautiful.” It has something to do with the faces evening out one another’s features to create a face with almost perfect symmetry. And symmetry is something humans are programmed to find attractive as part of some vestigial mating behavior. A better term might be composite faces than avaraged but it is a picture made of morphing the faces of many women into eachother. These pictures always appear beautiful because when you use many samples, the “less-beautiful” features of individual faces. There is the theory that our we inherently perceive the avarage of what we see in our life as beautiful, which might explain why most people prefer their own race or even just ethnicity. That could be tested through comparing the preferences of racially homogenous societies like Japan, Nigeria or Iceland with those of mixed race countries (atleast those where there isn’t a clear social border between them) like in many central American countries. These photos also need to be taken with a grain of salt because many countries have very different looking regional phenotypes so avaraging all might not really reflect the faces of people in that country. Germany and Italy would be examples of that. PS: I only got to this site because it used the link to the picture and thought I would explain it and since I’m more into natural sciences and not into normative social sciences, I will most likely not be able to reply on any further comments. Yes, young and beautiful, but iaren’t those the majority of our reponsibilities as “average women?” No shock THERE. But why are the clothes and the backgrounds “pixelated,” as if to obscure specificity? Only their identities are unworthy of protection? As mentioned in the comments they aren’t faces of real living people. They don’t have an identity to protect. They are faces created by merging large numbers of faces together on a computer. That’s also why hair and clothes are blurred – only features they all have in common appear clearly. I agree that the images above are very biases towards young women. I hope to start a project soon that collects images from around the world and from people of many ages so we can see the whole diversity of the human face. This is what my website is about – trying to understand how and why we make so many important judgments about people from their facial appearance. I just want to caution anyone who would like to critique this research programme (which does not use taxpayer’s money – I work on the website in my spare time as a university lecturer) to not commit the Naturalistic Fallacy. While we study facets of appearance-based prejudice, such as why women with feminine faces are also perceived as more trustworthy, studying a phenomenon is not the same as condoning it. However, I do welcome constructive criticism about how to make the site more accessible to all people and how to address topics that are important to people. Thank you so much for the wonderfully informative comment. Let me urge others to follow some of the links. The disagreement on the explanation of why symmetry in pictures of faces is considered beautiful again made me aware that we are talking about pictures, not faces as typically experienced. I’m wondering about inferring from the first to the second. I just stumbled across the site today. Hey I just stumbled upon this on an internet search, I thought it was worth telling you that these have been made at http://www.faceoftomorrow.com. It is an open-source projet (which means anybody can send their photos in to expand to it) where the photographer took photos from the local populace (regardless of ethnicity or age) and made a composite to generate an ‘average’ male and female face for each location. None of the people in those photos are real, their a composite made up of a 100 separate photos. (This is also the clothes, background and any long hair appear blurry.) There’s no racial or ethnic bias here, and in fact, if there was, it would rather defeat the point of the project. As Toiletman said, it is a known phenomenon for composited faces to ‘even out’ features, and the result naturally tends to favor younger, more ‘beautiful’ (for lack of a better word) looking faces. In fact, the composite faces are often more ‘beautiful’ than any of the individual photos that make the whole. is the argentinian girl the same picture of south african? That’s actually a load of craaaaap! If the average South African face is Caucasian in a country where Caucasians are only 10%, and therefore women of this race number 5% of the total population, wtf is average???? A deeply flawed method, unfortunately, that produced a viral image that many will take as fact. LIsa DeBruine wrote, “I will look up the top 10-20 last names of that nationality/ethnicity and search that name and the country.” Paternal surname bias, anyone? I agree that it’s a deeply flawed method. However, I did NOT make these images! Tey were made by some guy who used my website to do the averaging. This is where the photo composites were made. These averages OBVIOUSLY are not of the whole female population of such countries. It’s just something like a bunch, nearly 20 females I’d guess (and it also seems likely that the number varies from country/group to group — the ones that look considerably uglier/less prettier are likely to be composite of a small number of faces, some of which were not particularly beautiful), probably taken in universities or whatever situation one could find a bunch of photos with a flat background and no posing. The method of averaging per se is something like “morphing” every pair of faces into each other (like that Michael Jackson’s movie) and picking how the face is at 50% of each face, then doing the same with the bi-hybrid faces, forming quadri-hybrid faces, untill there are only two N-hybrid faces which are again mixed. An older method was a bit cruder, was just something like superimposed semi-transparent photos stacked over each other, but this method is inferior. The exercise is wholly without value, in my view. As a matter of very slight interest the photos were obviously specially selected for their youth and proportional evenness and any extra information about the process seems unknown. There is a world of difference between idealised beauty and attractiveness, leaving aside for the moment the inadequacy of photographic images in conveying the necessary information for making those judgements. We discussed this in class at my university. I found it most interesting, not that they are beautiful, which is a given when averaging faces, but rather that they could be related. The similarities between the faces is stronger than all but poly-zygotes. They were not necessarily “selected for beauty”, these are not “averages” in the sense that someone said, “hey, you average girl, I’ll take a picture of you to represent the average girl of your country” (like the photo on the last “imgur” link), but a composite of a reasonably large number of faces, and such methods are well known to make the resulting face look more beautiful (as rated/voted by many persons) than any given real face from the pool. The more “perfect”, doll-like, the more faces were used). There is one site on face research where you can pick faces from some dozens of photos that are available or upload your own and instantly generate a composite. I don’t know about the “value” of the exercise, I find it somewhat interesting to see, albeit I’d like to know more details such as how many people were used for each composite. And this is more interesting than the one with a random person from a country as it blends many people, it decreases the bias of individuality, instead emphasizing some common populational variations. BTW, I particularly tend to find prettier the composite with only a few pretty faces than the theoretically more beautiful composite made of a larger number of faces, which has less individuality. But I recall having seen some study in the sense that this is also a common observation/opinion. the most Focused here were Asia, Europe and South America. there was not a mention of Australia. Why on earth is South Africa represented by a white woman? Although there is a considerable white South African population, black people are still the majority there. What an insult. I had not thought of how the face of the average woman is youthful. The word average is suppose to include the extremes and outliers, but I find it difficult to believe that older women were factored into the equation. These are from thefaceoftomorrow.com. Honestly, give the artist credit where credit is due. Why is it that the average South African Face is white when 80% of the population is black and there are more women than men typically in the black communities…. strange…. a bit disappointed. Most of the white people in South Africa are of Scottish, Irish, English and German decent. So I thought that would be at least covered in the average face of their countries of origin, as is the case with Indian South Africans…. must say, quite disappointed that the black South African population is still pretty much invisible. We used this study in my psychology class last year. Like a previous commenter posted, they are composites of a hundred faces from the area indicated, based on volunteers from that area. It is for an ongoing psychological study. The idea/purpose behind the study is that Individual faces are never perfectly symmetrical, and the study shows that humans perceive beauty in the average (or layering) of all faces. The composited faces are layered over each other, and as they build the faces become more symmetrical and flaws are blurred out. When features are symmetrical, human brains find them more attractive (this is an accepted psychological fact based on extensive research prior to this study). The same goes for the male composites. 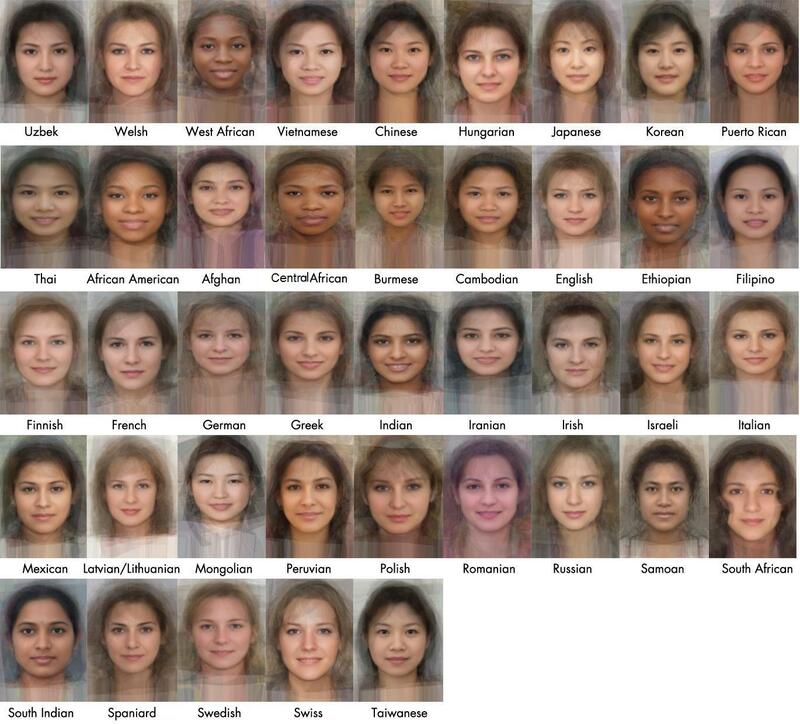 The photos IN NO WAY indicate that the women in the pictures represent what an individual average citizen looks, like but rather it is the average (or layering) of all 100 faces. The researchers are not picky or bias as some commenters have said, they are working with volunteers. Plus when you layer the faces, individual shapes and skin tone variations and aged skin are obviously going to be averaged in, but would blur/mix as the next layers were added. Essentially, many of you are getting mad at a perceived bias that simply doesn’t exist. These were done by a South African photographer Mike Mike. While in London studying and building his website he was intrigued by all the different nationalities he saw on the underground. This got him wondering what the average face might look like. He layered image of a face over another and so on till he got all these (beautiful) variants of the same face and there does seem to be a likeness that runs through all of them. Don’t know which face was the original one. All are lovely and not really “average”? I folks. Here’s a similar composite study of male faces. Thanks to the clever sleuths who tracked down the source :) My search for that led me here. Just to quickly explain the purpose of the compositing exercise: The point, as I understand it, is to validate the theory that human attraction is based almost wholly on the “averageness” of ones features (not just facial features either). The reason all the faces in these composites are lovely (I dare you to disagree!) is because they are quite representationally “average”. So the next time someone describes you as “average looking”, take pleasure in the highest compliment your genes can ever receive from a peer. Remember, these faces are mere artefacts: a real person could have a face very similar to any of these images, but it is very unlikely that such a person actually participated in the experiment.